Nearly 200 classic cars, rat rods, motorcycles and more lined the streets of downtown Osage City from 8 a.m. to 3 p.m. Saturday. 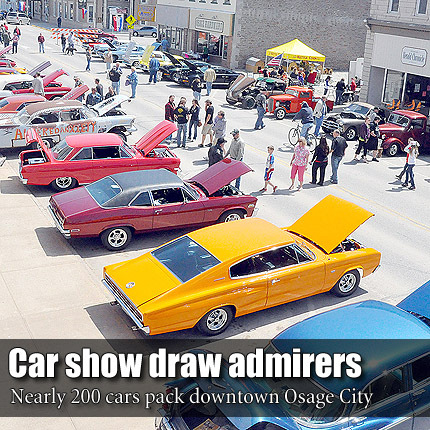 Approximately 200 participated in the ninth Annual Cruis’n and Cook’n auto show April 13 on Market Street, Osage City. Tom Nordling Memorial, John and Linda Carter, Lawrence; Dale Hendrickson Memorial, Larry Elgin, Burlingame; mayor’s choice, Carole Enfield, North Bend, Neb. ; and club participation, Kansas Outlaws. Choice Award – Motorcycles, Bill Renner, Topeka, Larry Chrum, Osage City, and Darland Walker, Topeka. Choice Award – Rat Rods, John DeYoung, Osage City, Leland Green, Wellsville, and Al Hoier, Ottawa. Choice Award – 49 and before, Bruce Prentice, Ottawa, Leonard and Linda Dieker, Emporia, Stan McNees, Ottawa, Phil and Debra Metsker, Lawrence, Sam and Margo Hughes, Ottawa, Frank Wiseman, Wellsville, Chuck and Step Vervynck, Lawrence, Jerry Alcorn, Herington, and Scott Thompson, Ottawa. Choice Award – 50’s, Larry and Mary Belangy, Topeka, Terry Powell, Council Grove, Tom Meisenheimer, Overbrook, Phil and Debra Metsker, Lawrence, David Shunk, Lebo, Larry and Jeannine Colstrom, Osage City, Larry Elgin, Burlingame, Gene and Mary Treinen, Osage City, and Greg Thill, Lyndon. Choice Award – 60’s, Donald Creason, Lawrence, Charles Glenn, Kansas City, Keith Hendricks, Topeka, Roger Flott, Topeka, Kent Cantrell, Harveyville, Bob and Sheila Meyer, Topeka, Rick Prockish, Berryton, Greg Colbern, Ottawa, and Clint Wandersee, Dwight. Choice Award – 70’s, Dan Gotobed, Shawnee, Billy Moss, Wellsville, Gary Walborn, Lees Summit, Dale and Marsha Syers, Kansas City, Curt Freed, Topeka, Tim Tollefson, Topeka, Don and Ginger Hobbs, Princeton, and Bill Johnson, Topeka. Choice Award – 80’s and 90’s, Dan Scott, Topeka, John DeYoung, Osage City, and Brad Bunger, Topeka. Choice Award – 2000 and after, Brian Jones, Ottawa, and Terry and Kay McCormick, Topeka. Top 10 – Carole Enfield, North Bend, Neb., Don Headley, Burlingame, Don Massey, Topeka, Mell Frazier, Topeka, Mitch Reed, Olpe, Jesse Tollett, Allen, Mark Carson, Osage City, Greg Walborn, Lenexa, Bruce Mischler, Lyndon, and Billy Moss, Wellsville. A “Model Contest” was included again in the show this year. The children of show participants could enter a model car, truck or motorcycle of their choice that they made. Participants voted on their choice. Participants and winners of the event – Colby Hokansan, Osage City, Brady Bowin, Osage City, Breckin Bowin, Osage City, Kelsen Egelhoff, Osawatomie, Kolden Egelhoff, Osawatomie, Laci Tebbetts, Daniel Tebbetts. First place, Kelson Egelhoff, Osawatomie; second place, Isaiah Karman, Burlington; and third place, Kolden Egelhoff, Osawatomie.